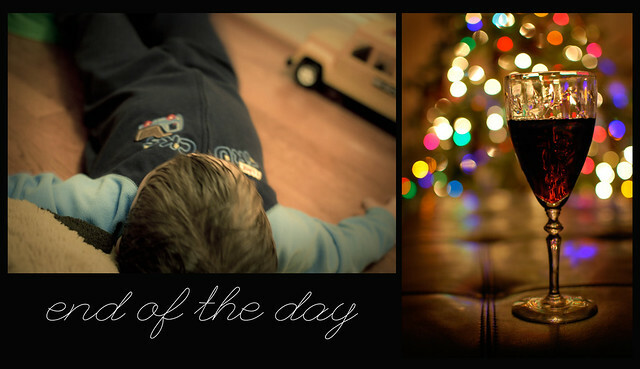 This week Cara and I chose end of the day as our theme. Originally I planned on photographing a steaming cup of tea. Now that it is cold outside I like to enjoy a hot cup of tea after the kids have gone to bed. I could not get the vision of one of my grandma's wine glasses sparkling in the christmas lights. So I took one for the team and had a glass of wine last night. I was really happy how my photo turned out. For once it came out exactly how I envisioned it. Cara's shot is so sweet. He looks so snuggly and ready for bed. My kids don't wear those footed PJs anymore, which makes me a little sad. I love everything about your photo, the bokeh of the tree (you amaze me that it's up already), the details of the glass and the DOF. Snuggly pjs are the bomb! And so is your pic of the wine glass in front of the tree!!! We are all such suckers for Christmas bokeh! I cant get enough of it and the season has just begun. YAY! :0) Such an awesome shot Jen. A great way to end the day! We truly are! Beautiful bokeh, so colorful and bright. Love that. Great shot. You had a beautiful vision, and a beautiful photo came out of it! I bet this photo is one that will have a lot of sentimental attachments tears from now. What a perfect way to end a day. will you please come put my tree up? i am just going to sit and admire yours instead...that is a gorgeous shot, jen. Your photo is really cool, love the lights in the background. Don't you love when it comes out like you envision it! That rarely happens to me! so peaceful, both of them. That is a fabulous shot...and a delicious looking glass of wine!